There’s more to plants than you know! 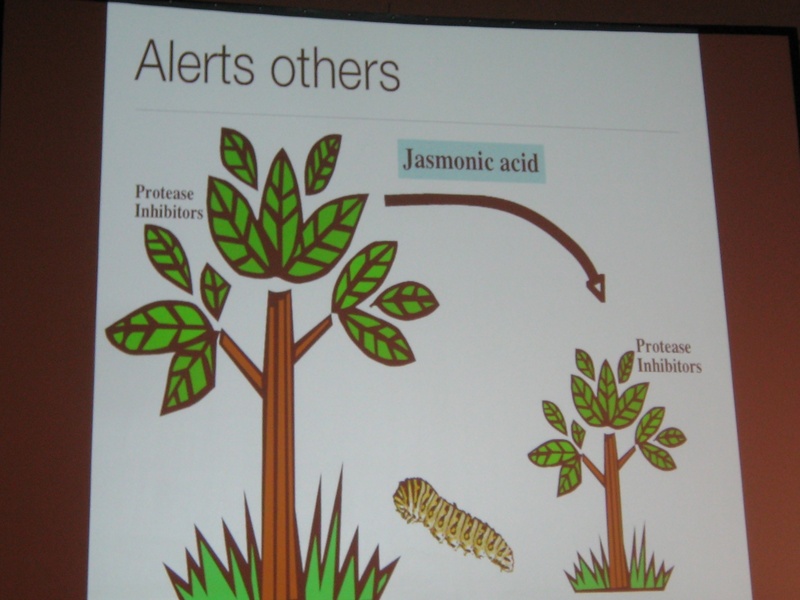 At this year’s Explore UT, Dr. Jennifer Moon gave a great presentation about how plants can detect light, respond to touch, establish defenses, and communicate with their kin. Here are some highlights from her talk. How do plants know when to germinate and grow? Dr. Moon talked about the importance of red light and far red light for plants. 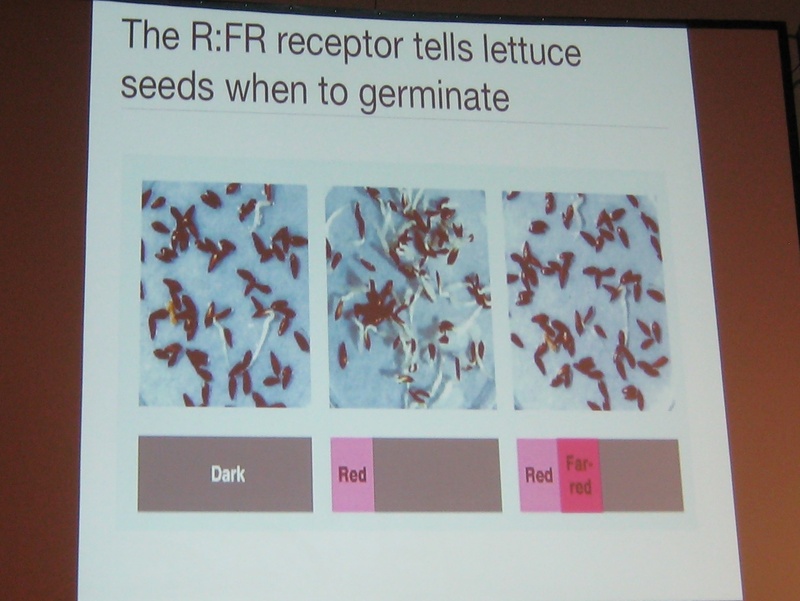 If plants detect more red light, they like to grow or germinate. If there’s more far red light, like in shade, it’ll deter germination or cause the plant to grow tall or sideways to look for sunlight. Will plants grow more if you touch them? No. If you touch them a lot, they’ll stay short because they’re afraid that if they grow too tall, they’ll be pulled out of the ground, like from a passing animal or wind. Do plants like to be talked to? Yes, but it’s not because of what you say. They like the carbon dioxide (CO2) that you’re giving them. 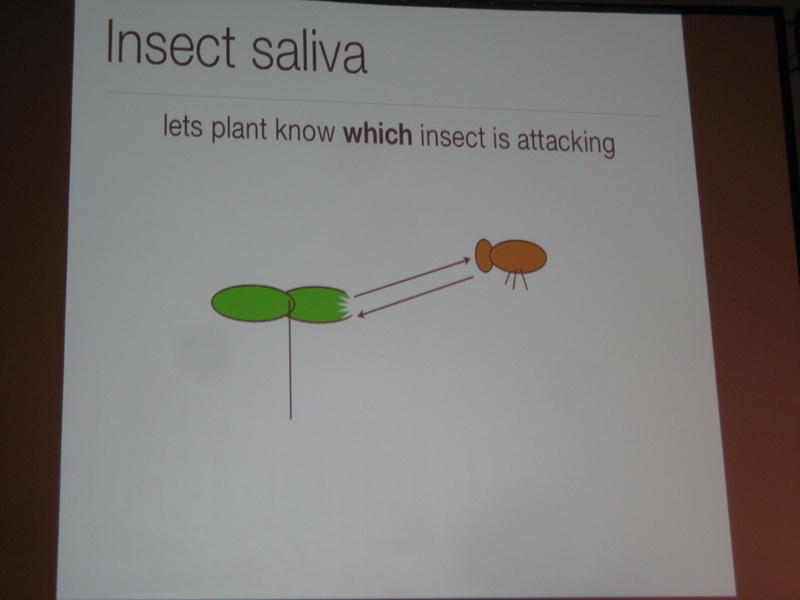 Can a plant know which bug is eating it? Dr. Moon described how a plant knows if you’ve cut it or if something is munching on it. The secret is the plant’s ability to detect insect saliva. They’re smart enough to know if you’re cutting it with scissors. If they detect that it’s a bug eating it, they’ll set up defenses. 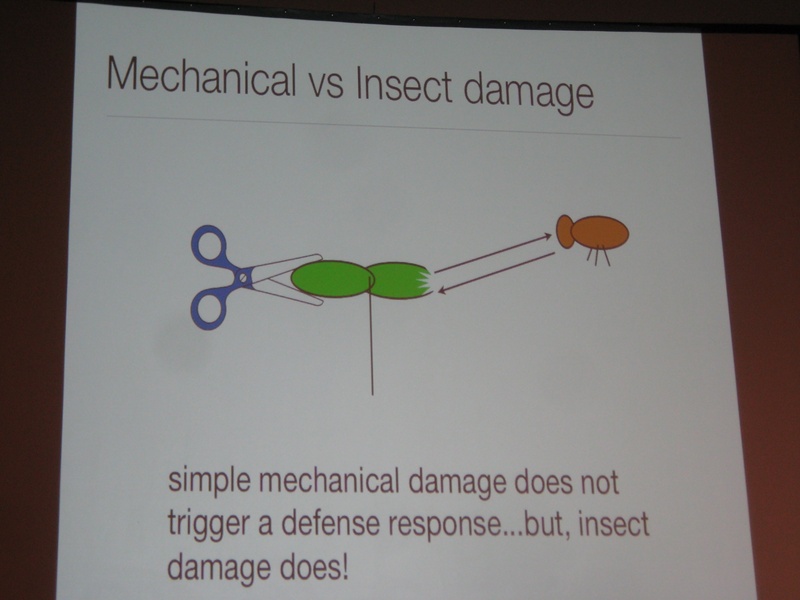 Some plants release a protein that causes insects that are eating the plant to starve and die. They can continue to eat the plant, but they can’t digest it. They’ll die and won’t be able to lay more eggs to create a new generation of pests to attack the plant. Other plants can release a hormone that attracts wasps that will attack the insects or lay eggs on them. I also learned that spices and flavors are part of a plant’s defense system. They may deter insects and some animals, but they make our food very flavorful. My favorite herb is basil, and my favorite spice is cinnamon. Dr. Moon showed us some great plant videos by Roger P. Hangarter from Plants-In-Motion. Watch this video that shows why it takes more than just a brief touch to cause a Venus Fly Trap to shut. It takes energy for a plant to close it’s leaves, so it’s best to do so when you think you have prey. Venus Fly Traps need the nitrogen from insects, since these plants typically grow in bogs that have little nitrogen available. Dr. Moon is a lecturer with the School of Biological Sciences in the College of Natural Sciences at University of Texas at Austin, and she has a cool website for the botanically curious at greenseedling.com. Each year, the University of Texas at Austin holds a campus wide event with fun activities and education for kids and prospective students of all ages. This year’s explore Explore UT event was held on March 3, 2012.